Recently, our seniors at CARE participated in a hands-on workshop about the health benefits and culinary versatility of ground spices. We know, then, that spices have many protective health benefits to offer, especially for an elder population. The question becomes, how can institutions and long-term care organizations incorporate spices more seamlessly into their menus? In the CARE lesson, our senior participants were given samples of seven everyday spices—cumin, curry, turmeric, cloves, paprika, cinnamon, and ginger—and encouraged to smell and describe them. Many of the seniors recognized these spices fondly: some remembered the smell of mulled wine at the holidays when asked to sample cloves, while others associated paprika with spice rubs for meat. Institutions can capitalize on the nostalgic power of spices by preparing traditional, seasonal dishes, making healthy adjustments (for example, reducing sodium in soups, or cutting sugar in baked goods) along the way. Nursing homes, adult day care centers, and other community institutions can also hone in on dishes that lend themselves easily to spice-based seasoning. These include marinades and rubs for meat or fish, hot teas, soups and stews, and mild curries. It’s also possible for institutions to think outside of the box, preparing snacks and dishes that serve as an unusual vehicle for spices. One of these is roasted chickpeas—a simple, savory, and protein-rich snack—which our seniors at care were able to sample during our one-hour nutrition talk! 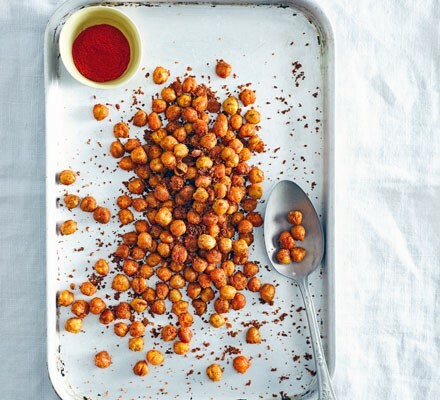 The chickpeas can be made in bulk and used for snacks or as a crunchy topping to entrées. It was incredibly rewarding to chat with our seniors about the health benefits of these evocative seasonings. Spices are a powerful example of how health and flavor so often work hand-in-hand, and they present organizations with an opportunity to enhance the taste of institutional food without sacrificing nutrition along the way. 1. Kunnumakkara, Ajaikumar B. et al. “Chronic diseases, inflammation, and spices: how are they linked? Journal of Translational Medicine. 2018: 16(1), 1-2. 2. Sun, Jia et al. “Role of curcumin in the management of pathological pain.” Phytomedicine. 2018: 48, 129-130. 3. Costello, R. B., Dwyer, J. T., Saldanha, L., Bailey, R. L., Merkel, J., & Wambogo, E. (2016). Do Cinnamon Supplements Have a Role in Glycemic Control in Type 2 Diabetes? A Narrative Review. Journal of the Academy of Nutrition and Dietetics, 116(11), 1794-1802. 4. Ranasinghe, P, Galappaththy, P. “Healthy benefits of Ceylon cinnamon (cinnamom zeylancian): a summary of the current evidence.” Ceylon Medical Journal. 2016: 61(1): 1-5. Older PostVegetables – when more is better!